Clothes Dryer Vent Safety. The minimum-allowed clothes dryer exhaust vent piping diameter for all installations is 4″. I’ve seen this material used in older homes as “dryer vent ducting” . Plastic should not be used! Reducers like 4″ to 3″ will cause a 25% or more reduction in airflow, and increase cost of operations. PVC can build up a static discharge and ignite the lint, causing a fire! Long Ductwork will reduce airflow, and be the cause of long dryer times. 90° Turns in clothes dryer pipes creates turbulence reducing efficiency and are the place lint collects! Chicken Wire is often used to block birds or squirrels. They also trap lint! Foil Flex Duct clothes dryer vent transition duct materials come in two types. Gas Dryer Foil Flex should only be used as transition between wall and dryer. Bathroom Foil Flex should not be used with clothes dryers. 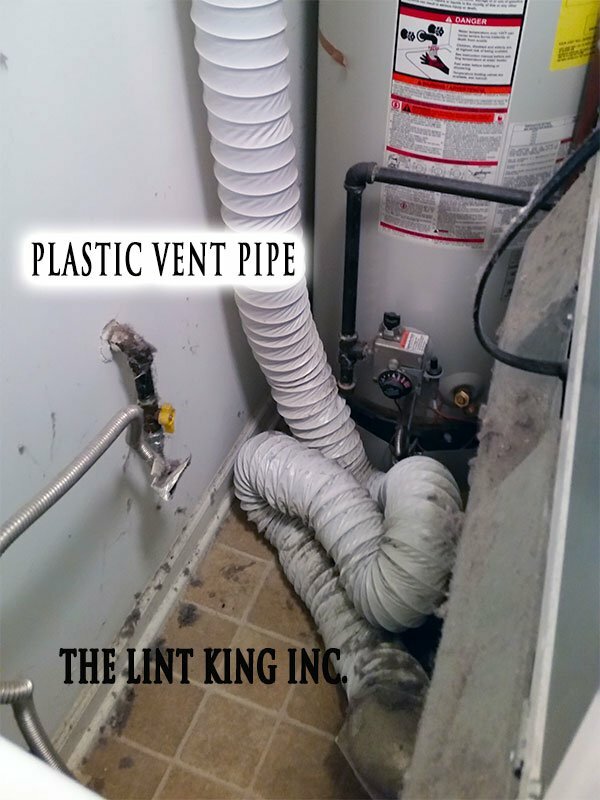 The Lint King Inc. prefers rigid-solid metal dryer vent ducting where possible for Clothes Dryer Vent Safety. TLK’s next choice is semi-rigid metal pipe. I found that this material is easily dented or crushed breaking open and leaking lint and other gases into your home’s interior. Wow! Did you know that heat builds up with a clogged dryer airway! Check out this article on CLOTHES DRYER TEMPERATURES that illustrates the various temperatures found inside your clothes dryers. Inside a clothes dryer are parts like; motor, controler, drum, heater, and many safety features. Modern clothes dryers have sensors for both normal safe operation and during unsafe conditions that risk a dryer fire in your home! High temperatures will cause an equipment failure, such as a humidity sensor, temperature control system, blower motor, fan, or timer control unit! A table of the normal and unsafe clothes dryer operating temperatures. 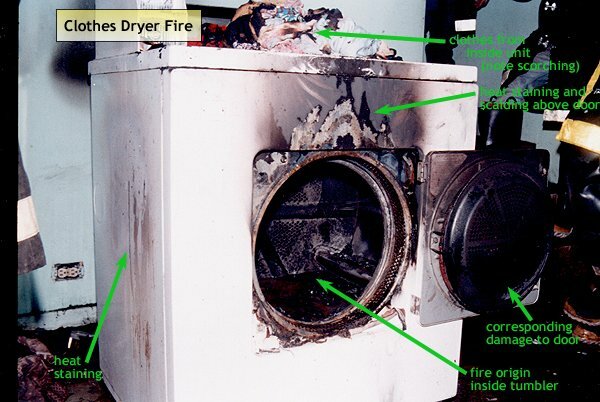 The NFPA estimated an annual rate of 16,800 fires, 51 deaths, 380 injuries & property loss of about $236 million – NFPA Annual Fire Loss Report for Home Fires Involving Clothes Dryers. Industry standards recommend that the maximum “concealed” rigid metal ducted clothes dryer vent length be no more than 25 feet. That effective length of a dryer duct with bends gets increased by 2.5 feet for each 45° turn and 5 feet for each 90 degree bend. If a clothes dryer vent is 25 feet in length and has three 90º elbows, which is very common, it would have an effective length of 25 + (3×5) = 40 feet! Clothes dryer exhaust vents should be directed to the building exterior. Do not vent the clothes dryer indoors nor into an attic, crawl space, or other enclosed area. … In ViolatIon of Local Code and Manufacturer’s Instructions ! Do not vent directly into the building’s attic, basement, crawl space, or any of the building’s interior walls. This will lead to moisture condensation on surfaces like the building insulation, building framing members, walls, floors, or attics. In these locations adding clothes dryer laundry moisture will certainly encourage mold growth. Even if the dryer exhaust vent does extend to the outdoors… an improperly installed, crushed, or disconnected dryer vent can leak lint and moisture. Even carbon monoxide (CO) can be leak into the building. Rusty or brown leak stains in ceilings may be traced to water leakage from a clothes dryer vent in the ceiling! Clothes Dryers that Vent into the Attic? Don’t vent clothes dryers directly into the attic space because you’re putting moisture into the attic. Now mold growth can start on wood surfaces and the in attic’s insulation. Clothes Dryers that Vent into the Crawl Space? Clothes dryer vent exhaust shouldn’t be hung near screen vent opening of the crawl space. Lint will clog the crawl space vent and the damp dryer exhaust air will create mold and mildew on the crawl space ceiling. 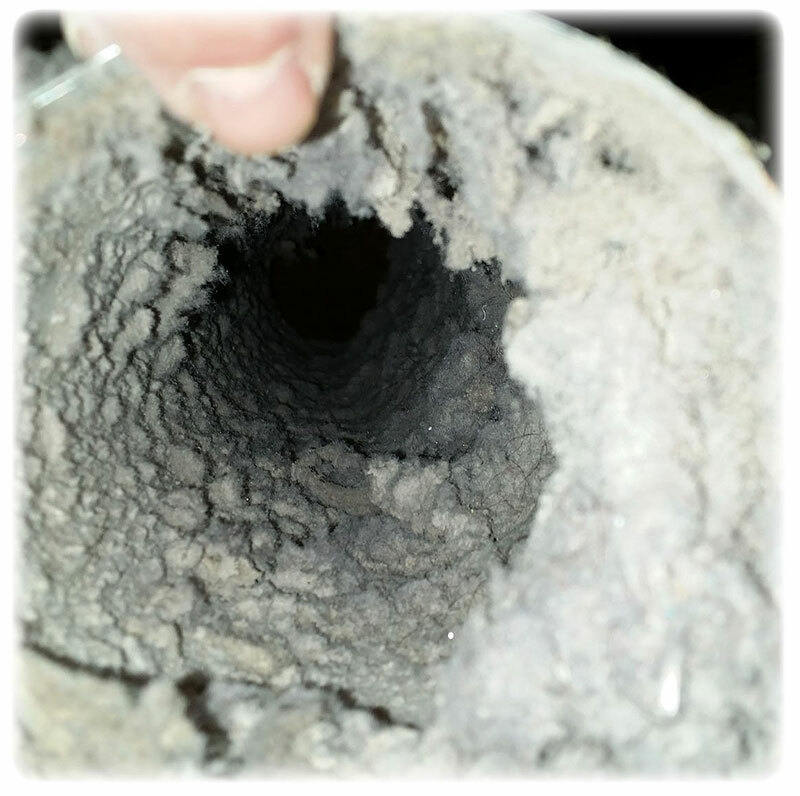 Claim Your $15 Off Dryer Vent Cleaning Coupon Now!